Most people I speak to about the Paleo lifestyle understand its benefits and can see it working for their family on some level. I most often hear the what ifs and what abouts around things like birthday parties, restaurants, grandparents’ house, and even school. In fact, my WordPress stats show me that many people come to this site via Google searches like Paleo lunches, Paleo birthday parties, and Paleo on the go. Clearly, this is a valid question for most people considering the switch to Paleo, and I completely understand these concerns. So today I thought I’d share with you the crazy-updside-down week that my family and I just lived through. After reading this you will see that eating Paleo is possible when life pulls you outside of the comfort of your own kitchen. 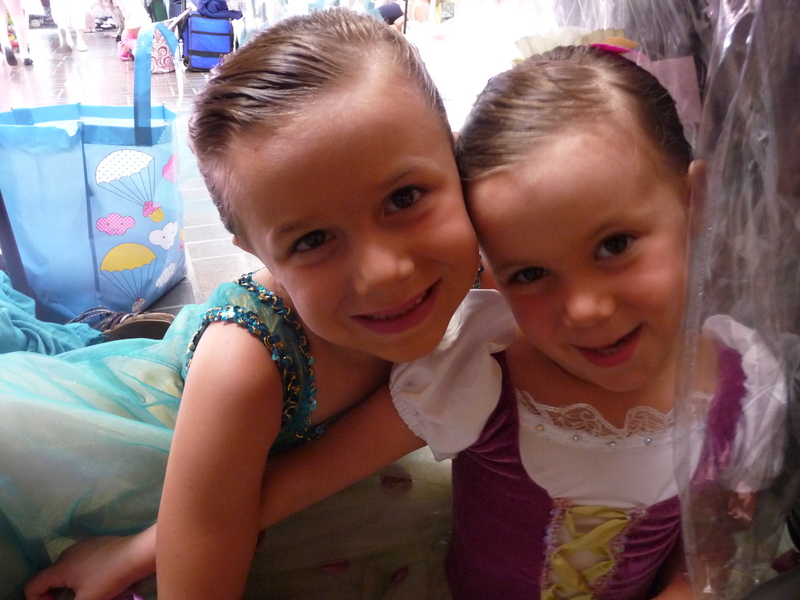 Dana and Charlotte participate in weekly ballet lessons, and twice a year their studio puts on performances. 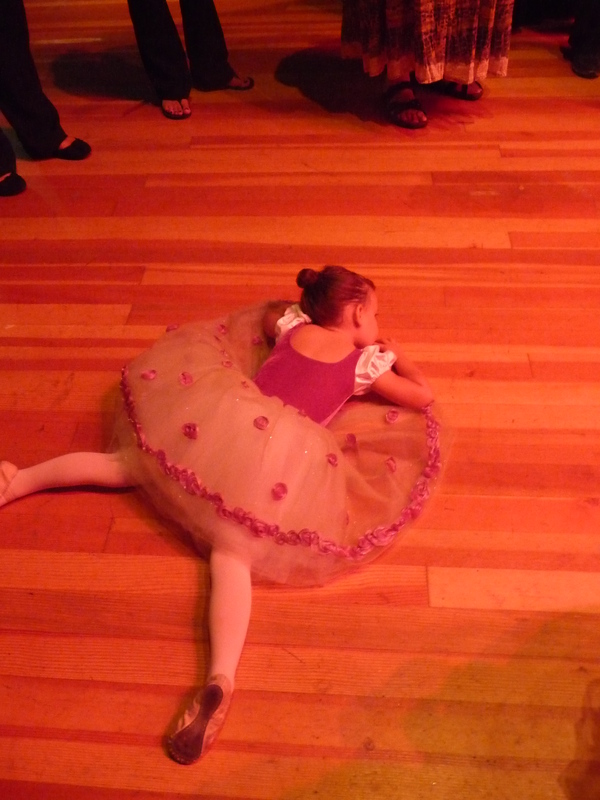 Last December, Charlotte made her performance debut in The Nutcracker. After agonizing over the decision of whether she was ready for a commitment to the classes, the rehearsals, getting on stage, and the chaos of it all, she put our mind at ease and performed like a champ. Her motivation to perform and endure the challenges that come with it most likely come from the years of watching her sister dress up in costumes and make-up to be cheered and praised by friends and family. Having survived the stress and anxiety of the December performance, we knew she would love the performing experience again and we used what we learned to be better prepared this time around. On the night of the dress rehearsal, we were told to arrive at 5:00pm. 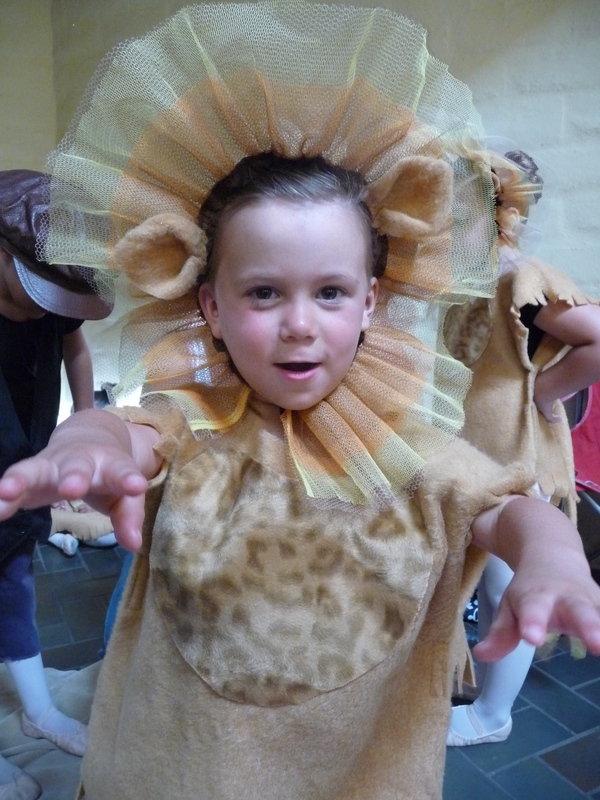 Both girls needed to have hair and make-up done and were instructed to bring dry snacks, not to be eaten in costume. As you can imagine, examples of dry snacks were non-Paleo foods like crackers, pretzels, and granola bars. I entertained the idea of eating an early dinner just before we left, but with a 30 minute drive to the stage, hair and make-up to be done, and a nap for Charlotte until the last possible second, packing food for dinner was the only option. I had planned ahead the night before by roasting a large chicken with lots of meat and baking a few extra potatoes, ensuring easy-to-pack leftovers. Dana’s Planet Box is shown below. The foods were not exactly dry, but not messy either. I kept an eye on her in the holding area backstage and made sure she used her napkin, didn’t eat in her costume, and washed her hands immediately upon finishing her dinner. I also let her know that other kids would have junk food/fast food, and that just wasn’t an option for us. Charlotte’s dinner was similar, but catered to her preferences. Lots of napkins and washing hands kept her and the costume clean and her belly full. Both girls performed beautifully and the recital was a huge success! 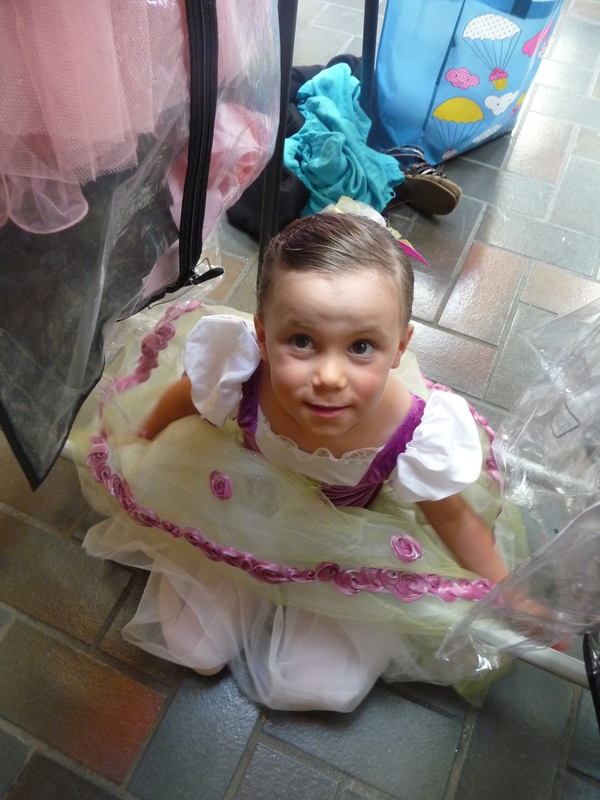 It’s worth mentioning that the anxiety that comes with hours of waiting in a holding area filled with jittery, young dancers brought Charlotte’s needs for sensory input out in the open. I managed to snap a few shots of her regulating herself in a stressful environment. While these situations are not ideal, I was very proud of her for finding ways to stay calm enough to avoid a meltdown, still remember her dances, and even smile on stage. On the night of the recital, Chad mentioned to me that his stomach was not quite right and he was feeling pain and discomfort. At 3 am, he woke me up from a sound sleep and let me know this stomach pain was like nothing he had experienced before. We phoned the ER, and he was told to come in with a driver. 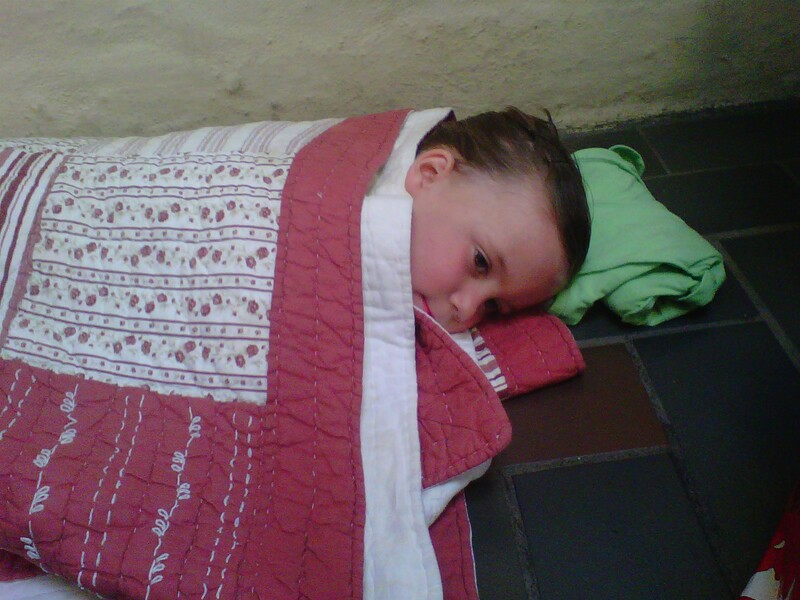 I made a call to my amazing friend Siiri, and she arrived at our door within minutes to stay with our sleeping kids. After isolating the pain to the lower right quadrant of Chad’s abdomen and getting a CT scan, it was determined that he was in the midst of an appendicitis attack. We were thrilled to see our friend Dr. Mike at the hospital who reassured us that this was a random event that had nothing to do with diet, lifestyle, or overall health. With a sigh of relief, Chad slipped into a morphine nap and we waited for an OR to open and have his angry appendix removed. I checked on the kids and then began to think about some breakfast for myself. Seeing that my health issues tend to center around stressful events, bringing on excessive adrenaline, I knew that some clean food was in order to get me through a long day at the hospital. I fought feelings of panic and anxiety as I approached the hospital cafeteria cautiously, expecting to find nothing suitable for to me eat. After my Paleo breakfast and a hot cup of coffee, I felt much better and Chad and I hung out until it was time for his surgery. After I got word from his doctor that he had made it through surgery, I ventured back down to the cafeteria for lunch. I ordered a bunless hamburger from the man at the grill and cheated with some sweet potato fries (I’m sure it was not coconut oil that I saw in the deep fryer). Once Chad was settled in an overnight room, I was back at the cafeteria for dinner and asked for a grilled chicken breast to sit on top of lettuce greens and veggies from the salad bar, drizzled with olive oil and balsamic vinegar. When I returned to Chad’s room to eat my dinner, he joked at how Paleo it was and that we should consider a date night at the hospital cafeteria. While it was surprising to find Paleo options at the cafeteria, it did take a certain amount of will power and focus to walk past plenty of packaged foods and treats that seemed to be more tempting in times of stress and little sleep. Resisting this temptation and eating clean paid off when I returned home at 8pm and found that I had enough energy and sanity to put my very tired kids to bed. I gave huge hugs to my incredible friends Kimberly and Siiri who not only kept my kids entertained all day but managed to feed them Paleo all day as well. There was no rest for the weary over the weekend at home as I tended to Chad in his recovery, nursed Charlotte with a throat virus and a fever, got my house back in order, and managed my own needs for sleep and rest. In the midst of this chaos, I kept the upcoming week in the back of my mind. Dana was scheduled to attend a week-long day camp at our church, and I had been informed of the provided snacks via email. While we normally opt for packing our own snacks at events where a non-Paleo snack is provided, this situation provided a bit more of a challenge. All of the snacks were tied thematically to the day’s lesson, and most of them involved junk food, including goldfish crackers, pretzels, marshmallows, whoppers, and other candies. I knew that asking Dana to sub a box of raisins for these super fun activities and treats was too much to ask. She is still a kid, after all. I talked to her about the situation, and the food options would may have worked fine if it were just a one day camp. But given that the camp was all week and the fever bug was running through our house, I knew I needed a more Paleo option to give Dana the best chance at staying healthy and enjoying the camp. 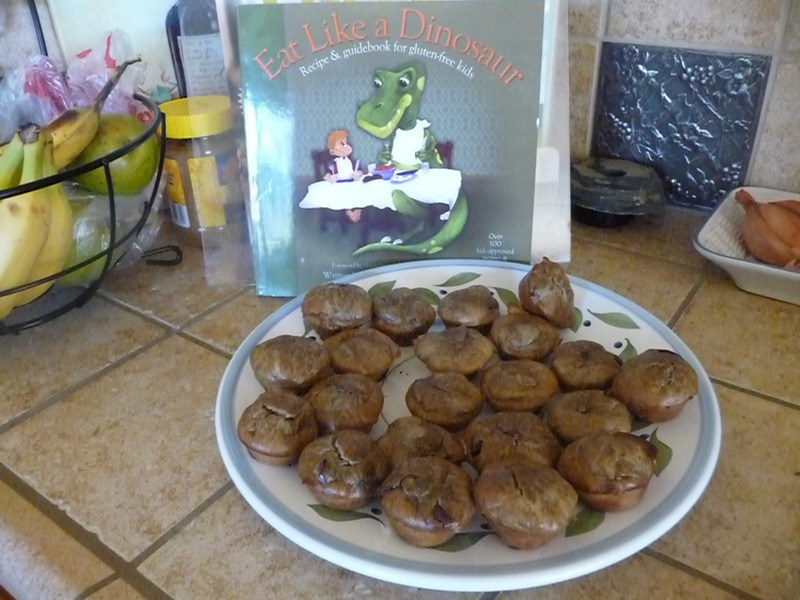 I remembered seeing a cookie-like treat made with sunflower seed butter in our copy of Eat Like a Dinosaur by The Paleo Parents. I was so relieved to find a quick and easy recipe for Mini Nut Butter Cups. We made a bunch of super-yummy, kid-friendly, nut-free, muffin-shaped cookies with just a few ingredients that were easy to transport. This morning we filled a baggie with a bunch of grapes and a few cookies and sent her off to camp with a snack that she was excited to eat, despite what the other kids had. We survived this week and managed to eat clean with the help of our amazing friends, some luck, lots of preparation, and a wonderful resource. It has taken two years, but I can proudly say that we have established a lifestyle around Paleo. We were able to make it work in the most trying of circumstances. So the next time someone asks us about Paleo and all of the what ifs and what abouts, I’ll remind them that it’s not just a way of eating, it’s a way of living. 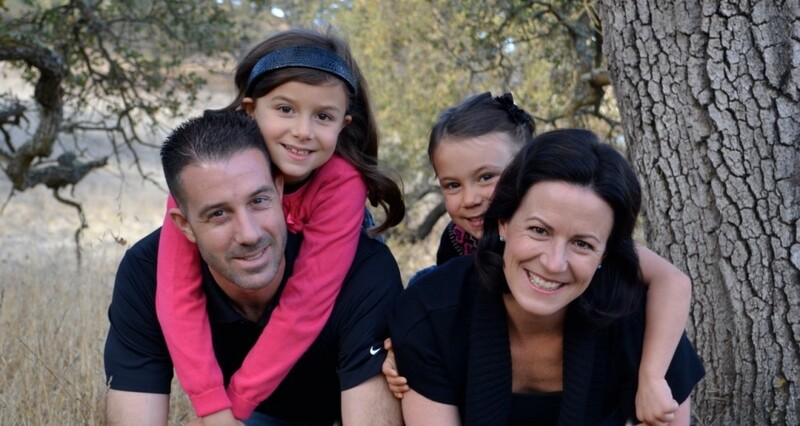 For more inspiration on staying Paleo in trying times, read about NomNomPaleo’s adventures of living in a hotel room with her family for the last 2 months. 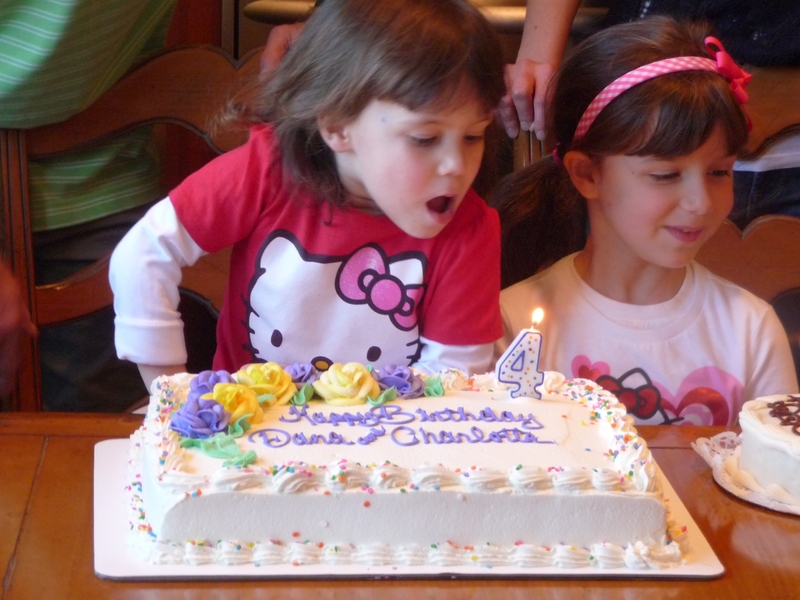 We recently had a birthday party for Dana and Charlotte. It was a relatively small gathering for a few friends and family members at our home. We served lunch, sang happy birthday, and enjoyed cake. No one would ever know that our family, and specifically, our kids ate a diet that was different from any other child at the party. The lunch spread included deli trays of ham, turkey, roast beef, salami, cheeses, and other antipasto treats like olives and sun-dried tomatoes. We did provide some dinner rolls for those who chose to make sandwiches. The crowd favorite was an enormous bowl of freshly made guacamole. We provided corn chips (gluten-free) and veggies for dipping. There was also lots and lots of fresh fruit. We received many comments on how fresh and delicious the food was. It was not limited to a Paleo diet, as most of our friends and family members eat grains and dairy, but we were still able to provide the birthday girls with a delicious lunch of their favorite Paleo foods. I can assume that the positive comments that we received from our friends and family were based on the fact that our fare was considerably different from a typical meal served at a kids’ birthday party. Foods of convenience like pizza or frozen hot dogs or hamburgers are the mainstay at kids’ birthday parties these days, and if you are trying to raise a Paleo family, you recognize what a challenge this is. In the defense of other parents who choose throw a *traditional* party for their child with pizza delivery and store-bought cake, it was a lot of work and a significant expense to provide the spread we did. We woke early to prepare food, made a trip to pick up the deli trays, budgeted the expenses, and planned ahead to find a gluten-free cake that would be okay for the girls to eat. Our situation and lifestyle demands this type of planning and preparation. We take that same mindset into modern-day parties and social events outside of our home when we know that there are going to be limited options for our kids to eat. Being prepared to attend a birthday party or social event with your children is the same as being prepared to go anywhere. You pack your child’s homework and anything they need for the day when they go to school. You pack a suitcase for going on a trip. Before a birthday party, you even buy and wrap a gift. Thinking about the food that you and/or your child will eat at that party is an often missed but crucially important next step. *Email or call the parent and ask what they are planning to serve at the party before you attend. 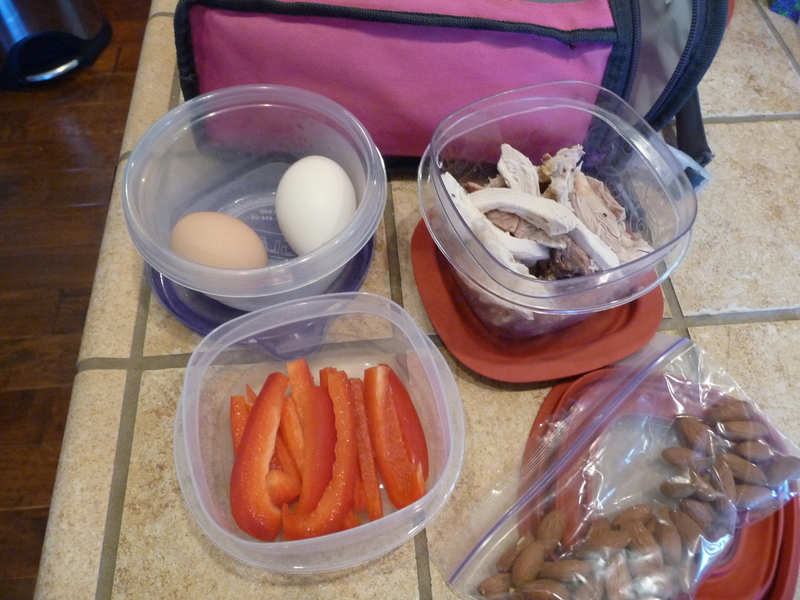 Explain that you are making some changes to your child’s diet and you want to be prepared. You may get lucky and have grilled sausages or barbecued chicken with fresh fruit and veggies. 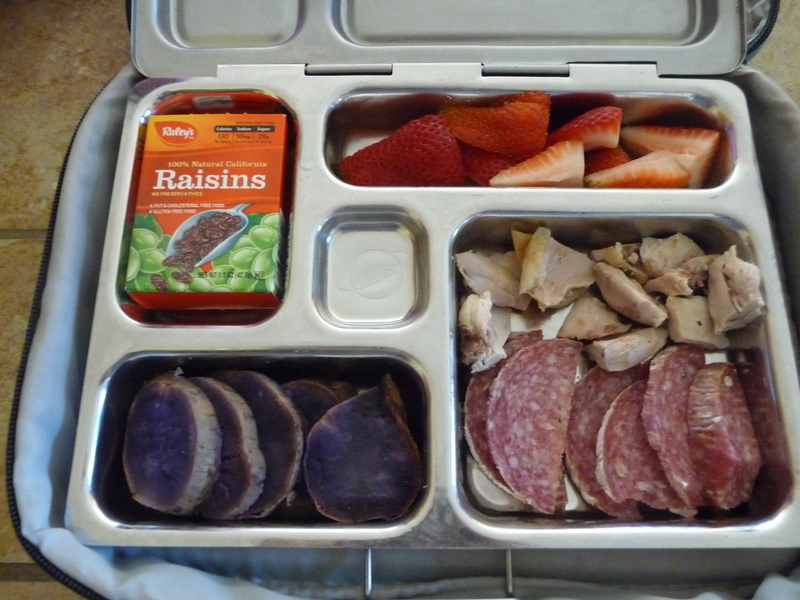 *Feed your kids a big breakfast or lunch before attending a party where the entrée is not Paleo approved. If they feel full and don’t have a strong desire to eat, allow them to nibble on a few pieces of protein and spend their time playing and enjoying the party. *Bring your own food. 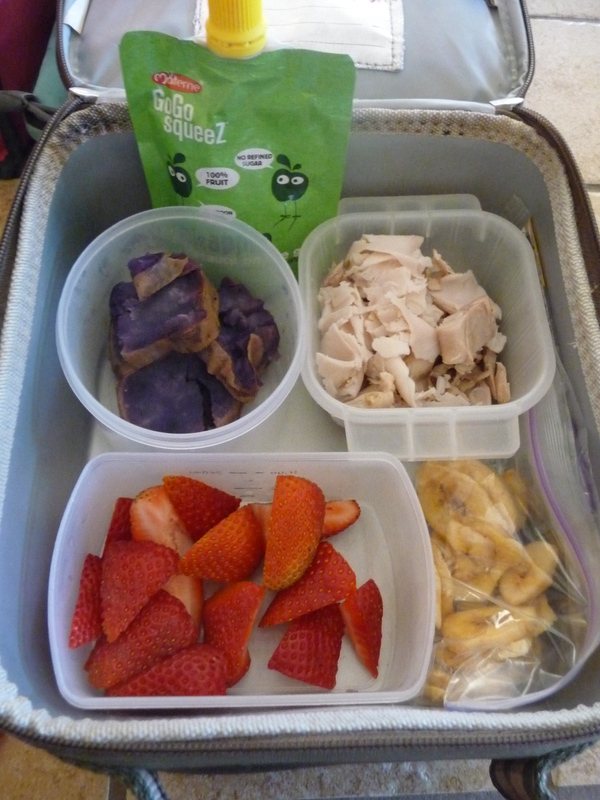 Pack a large snack or a lunch box for your child just as you would if they were going to school. If you feel the need, reach out and explain your child’s special diet. In my experience, this typically does not offend a party host or hostess, especially if you’ve taken care of the meal yourself. Oftentimes, the cake is the most sought-after part of the party for kids. After they have just consumed pizza or other convenience food, they can’t wait to wolf down a store-bought cupcake loaded with unrecognizable dyes and flavors, not to mention gluten and sugar. My trick for the cake part of any party is providing a substitute treat that my kids love to eat. Our family favorites include Curious George Bars and Tootsie Pops. These products including are sugar-laden, but typically gluten-free. (They may not be labeled as such as they may be produced in a processing plant that also processes wheat–please check with the product manufacturer if your child is particularly sensitive) Other options include homemade Rice Krispy treats or a homemade grain free dessert. Our favorite cookbook and website for delicious homemade grain free treats is from Bill & Hayley at the Food Lover’s Primal Palate. We all love the Coconut Cake with Coconut Cream Cheese Frosting in cupcake form. This post wouldn’t be complete without a note about the uniqueness of your kids. After living Paleo for 2 years and attending numerous birthday parties with a 4-year-old and 7-year-old, I can safely what works for us, but I can obviously not predict what will work for your family. Some kids are more sensitive to eating something different from the other kids. Other issues may be around giving up favorite foods and sacrificing party foods may just be too much, too soon. If you are leading your family on this Paleo journey, only you know what your kids can handle. That being said, talking to your kids before any non-Paleo outing and setting expectations is a good rule of thumb. Understanding the needs and listening to the concerns of your kids before you are stuck in a no-win situation at party mealtime goes a long way. With Charlotte, we often show her pictures of where we are going, show her the food we have packed for her to eat, and let her know she has her own treat instead of cake or a cupcake that will “give her a tummy ache.” Dana can tolerate more non-Paleo treats than Charlotte can, so we often compromise with her. She’s a smart and sassy 7-year-old and has learned what we can live with as parents and when we put our foot down. She recognizes that this is our lifestyle, but we also try to be sensitive to how she feels eating something different from other kids. If she really wants a cupcake or piece of pizza, we try to discuss it before we arrive so we are all on the same page. All of this may seem overwhelming and intimidating at first, but it does get better. Try to be as consistent as you can with your kids while still understanding that they are just kids, after all. As you progress with eating more Paleo foods, they realize that eating birthday party foods makes them feel yucky and cranky. Consistency with your food choices also helps your friends and family members understand that you are making conscious health choices for the sake of your child. Over time, they may become more sensitive and accommodating to your dietary needs. Until then, preparation and practice are the keys to success. I was teaching third grade in the Spring of 2004 when I learned I was pregnant for the first time. I had a few years of teaching under my belt, and I had learned a lot about kids without ever having any of my own. In all honesty, I thought I was pretty prepared to be a parent. I had a good grip on discipline, motivation, and overall management. I had also recognized the importance of supporting education at home and how it made all the difference in finding succees in the classroom. As my belly grew, I spent lots of time studying the faces and behaviors of the students looking back at me. I wondered often what the child inside me would be like in one of those small yellow chairs. What would she look like? How well would she listen? Would she be helpful or shy? Visual or kinestethic learner? Friendly or needy? I have always aimed for some level of perfection, so I secretly prayed for a daughter who would be good at all of it….an academic whip without boredom, a social leader without being bossy, helpful and kind while still knowing her place. It was my heart’s desire that she would be all of the things that I only had the potential to be. Depsite my silent expectations, I knew she would be loved unconditionally, and I vowed that all of the things that stood in the way of my childhood success, in and out of the classroom, would never be known to her. Someone was listening. God gave Chad and I the most beautiful, bright, academic, social, and sweet child that anyone could ask for. She hit all of her milestones early and learned her letters and numbers before she could talk. She learned concepts with incredible ease and I soaked up every moment….teaching her vocabulary words and phrases way above her age level. Using foam letters in the bathtub, at the age of three, I taught her to rhyme and eventually read. I couldn’t help it…the teacher in me thrived on her ability to learn…the parent in me beamed….and the inner child in me was reborn. 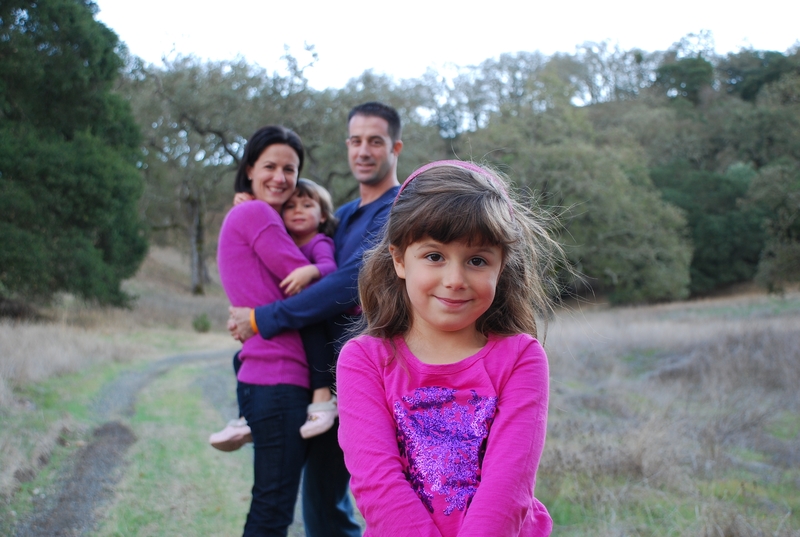 On Father’s Day 2007, we found out that Dana would be a big sister. With all of the same preparation and secret wishes, I birthed another girl. I wondered how I could be so blessed with two daughters, just like my sister and I….so many opportunities to make their lives all that ours were and so much more. And then things unfolded so differently than I could have ever imagined…Charlotte stole so much of my time from Dana in those early years. I was angry at my powerlessness to continue to give Dana what she needed to be all that she could. With shame and guilt, I shared these feelings with Chad, and we pulled together to make a great team in those difficult times. We did the best we could with the challenges we were handed, but all the while, I wondered how badly I was breaking her. Anxiety, guilt, and resentment became rocks in my backpack. My dreams were crushed when Charlotte’s misbehavior spilled into our lives. The timeouts that worked brilliantly with Dana turned into screaming, endless, exhausting tantrums. I helplessly watched sensory seeking behavior and our ineffective discipline take over any outing or activity. The family I had dreamed of was within reach but still seemed so far away. What had happened? Where did the happiness and pride go? What had we done wrong? Just when we thought it couldn’t get any worse…somehow learning made the difference. Slowly at first and then with a depth of wisdom and knowledge I never could have experienced in any classroom, we learned who Charlotte was, instead of who she wasn’t, and by God’s grace, we taught Dana through words and actions how to be a sister to Charlotte. And just like she has always done, she learned and loved and beautifully bonded with her sister in a way that we could have never expected. Charlotte’s needs opened our eyes to a whole new world that we were trying desparately to hide from. Beyond our fears and expectations was a beautiful valley of peace and acceptance. Just this week Dana received a glowing report card showing all of the perfection I had originally dreamed of. While I read it I beamed with pride as a teacher and parent, and then I paused and said a silent prayer of gratitude for each daughter…thank you for the one I wanted, but thank you even more for the one that we all needed.